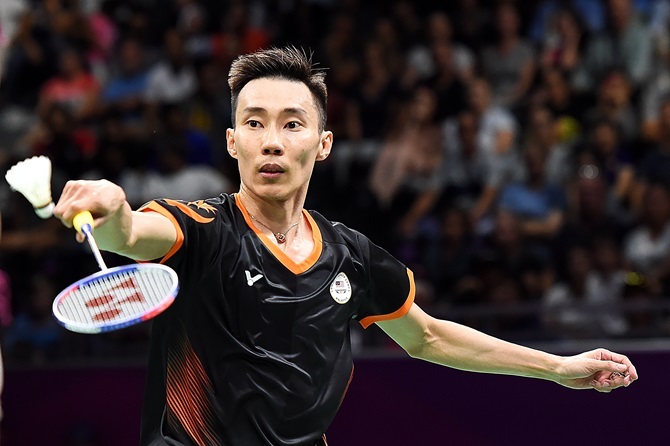 Veteran Malaysian shuttle Lee Chong Wei beat young Japanese Kento Momota 21-17, 23-21 to win the Malaysia Open title for a historic 12th time, in Kuala Lumpur, on Sunday. The home favourite Lee executed a sensational attack strategy that left the rising star Momota confused and flat-footed. In the women's singles final, top seed Tai Tzu Ying from Taiwan saw off China's He Bingjiao, winning 22-20, 21-11. India’s challenge ended in the semi-finals with the exit of Kidambi Srikanth and Pusarla Sindhu. Srikanth was beaten by Momota 13-21, 13-21 while Sindhu went down fighting to defending champion and world No 1 Ying of Chinese Taipei 15-21, 21-19, 11-21. Lee, 35, needed 71 minutes to avenge his defeat to Momota, 23, in the semi-finals of the Asian Championships in April. The defeat brought an abrupt end to Momota's 21-match winning streak. "There was some pressure for me to win this tournament," Lee told reporters later. "Now I have won the Malaysia Open for the 12th time. I hope this will encourage me to do well at the World Championships and Asian Games." The world number six Lee left Momota hapless with his sharp overhead drives to take the opening game 21-17 in 30 minutes backed by a raucous home crowd. At times during the game Momota was left bewildered. But in the second game, he recovered admirably with similar powerful overhead smashes and some brilliant defence work. Momota was full of praise for Lee. "Even though he is 12 to 13-years older, he is a strong player and still dominates men's badminton." Gaganjeet Bhullar could not match Jazz Janewattananond's sensational play on the final day as the Thai golfer came up with a streak of five birdies to win the Queens Cup, presented by Bangchak, in Pattaya, Thailand, on Sunday. Bhullar and Jazz began tied for first at 15-under and both turned in 1-over. Both birdied the 10th, and then the situation changed as Jazz birdied the next four while Bhullar just could not find the same touch. He also bogeyed the 15th. The Indian saved two good pars before a closing birdie and a card of 71 which gave him sole second as Jazz parred last four to finish at 19-under and four clear of Bhullar. American Sihwan Kim (70) and Pavit Tangkamolprasert (71) of Thailand shared third place on 270 Phoenix Gold Golf and Country Club. The 30-year-old Bhullar, whose last win was Macao last year, missed his ninth Asian Tour win. He came close at the Maekyung Open in Korea in May but settled for a share of second place after he was defeated in the play-off and this was his second runner-up finish this season. “It wasn't easy out there. It was definitely one of the toughest days this week. I didn't get off to a good start. I made a few silly mistakes as well. But I finished strong, had two good par-saves on 16 and 17 and a good up and down for birdie on the last to finish sole second," said Bhullar. 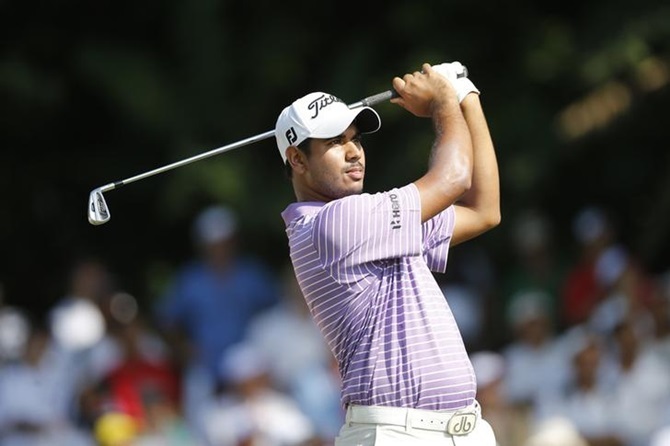 Khalin Joshi (68) was T-14 at 10-under, while S Chikkarangappa (68) and Rashid Khan (72) were T-21 at 8-under. Honey Baisoya carded 66 and at 7-under finished T-30, Viraj Madappa (70) at 3-under was T-46th and Himmat Rai (72) at 1-over was T-60th. South African Caster Semenya, whose middle-distance career could be under threat because of a new IAAF rule, romped to the fourth-fastest women's 800 metres ever and Qatari Abderrahman Samba produced the second-best 400 metres hurdles of all time in a sparkling Paris Diamond League meeting on Saturday. Olympic and World champion Semenya cruised home in a lifetime best 1:54.25 and the dominant Samba clocked 46.98 seconds for his fifth consecutive Diamond League win. Semenya, who is challenging a new hyperandrogenism rule by the International Association of Athletics Federations (IAAF), took nearly a second off her personal best as she claimed her 25th consecutive final win in the event. Burundi's Francine Niyonsaba was second in 1:55.86. "I did not expect that," Semenya, who ran without pacemakers, told reporters. "I was thinking 1:54.99 could be possible but this was great." 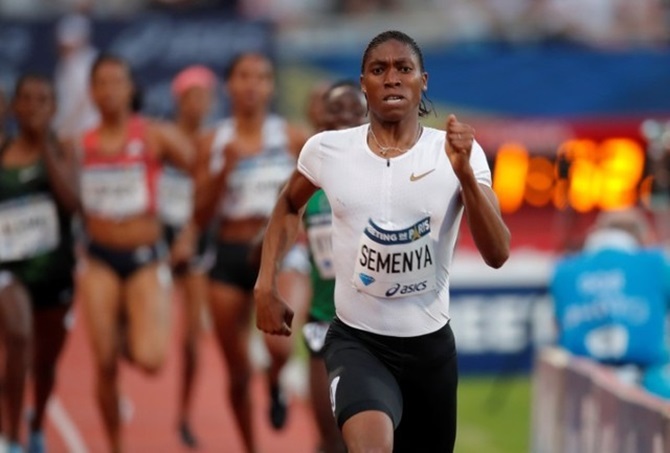 The IAAF rule, against which Semenya has appealed to the Court of Arbitration for Sport (CAS), would effectively give her a choice of taking medication to restrict her testosterone level or move to longer-distance events. It is scheduled to become effective in November unless overturned by CAS. "I am just a human and if you want to be an inspiration to the world and to the youth, you cannot focus on negative things," Semenya said. Only Czech world record holder Jarmila Kratochvilova (1:53.28), Ukrainian Nadezhda Olizarenko (1:53.43) and Kenyan Pamela Jelimo (1:54.01) have run faster than the South African. Samba became just the second runner to break 47 seconds in the 400 metres hurdles. The other was American world record holder Kevin Young, whose 46.78 won the 1992 Olympics. "I made a small mistake at the start, lost my balance on the first hurdle so I did not expect to run so fast," said the 22-year-old, whose previous best was 47.41. Russian world champion Mariya Lasitskene also continued her dominance, winning her 45th consecutive high-jump competition with a sparkling season's best of 2.04 metres. All told, seven yearly bests were set or equalled at the meeting. American world champion Sam Kendricks soared 5.96 metres to win a high-quality pole vault over young Swede Mondo Duplantis (5.90) and French world record holder Renaud Lavillenie (5.84) and American Ronnie Baker gained a share of the year's 100-metres top time with a personal best 9.88 seconds. Kenyan world silver medallist Timothy Cheruiyot became the first 1,500-metres runner to dip under 3:30 this year as he easily won in 3:29.71, and countrywoman Beatrice Chepkoech led a Kenyan sweep in the women's 3,000-metres steeplechase with a personal best 8:59.36.